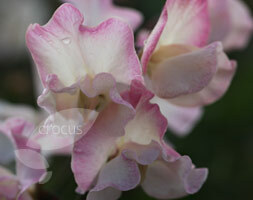 Each picotee petal has a creamy coloured base that becomes pinker towards the outer edges. The scent of the flowers is strong and delicious and the blooms are of exhibition quality. Mix it with rich pinks and plums or lilacs and purples for a great effect. Not just pretty to look at though, they will also act as a magnet for beneficial insects.